You are here: Home / Product Reviews / Babies & Kids / How to Pack for a Family Vacation + FREE Beach Vacation Checklist! How to Pack for a Family Vacation + FREE Beach Vacation Checklist! Disclosure: This post was sponsored by the makers of BENADRYL®. Thoughts and opinions are my own. How to Pack for a Family Vacation. They say that travel is the only thing that you buy that makes you richer. It is the one things that will leave you speechless then make you a storyteller. Before you tell those stories though, the first thing to consider is everything you will need for the destination and the adventures that await you once you get there. Sometimes, we crave the cold and want to see the gorgeous landscapes that are covered in snow and lit by the Northern Lights. If that is the case, you will need to bring enough clothes to keep you warm. Research what the lowest temps your destination can reach and bring gear that can handle it. Depending on what you will be doing, you will need corresponding gear for excursions. As always, safety items like a well-stocked first-aid kit is a must if you will be outdoors. The most popular family vacation destinations are tropical though and if you’ve decided on a tropical get away, make sure to pack enough clothes that will keep you cool in the hot temperatures. To be cautious, bring a light sweater in case there are off-season temps. Always bring more than one bathing suit so that after you’ve worn one, you can wash it and let it dry and have a dry one the next day to use. TIP: Always pack a swim suit, water shoes and outfit in your carry-on. In case your luggage gets delayed or if you want to go into the pool before you check-in and have your bags. Before you head out, it’s a good idea to print out your plane tickets, car rental confirmations, hotel and resort reservations and scan your passports and email them to yourself. If there is the chance of losing them, you will have a copy to show for identification. Baby bottles, sippy cups etc. Nothing beats the excitement of getting to see a new part of the world or going back to one of your favorite destinations. Especially if it has a pool, beach or natural waterfalls or springs! Being prepared always makes for a more enjoyable trip. Believe me, there’s proof in the pudding. Packing back-pack carry-ons for your kids is incredibly helpful to keep them busy before, during and after your flight. You can pack books, games or favorite toys and any electronics and headphones they will use during the flight. You can even pack snacks in plastic baggies for in-air treats for each child. Make sure to pack an outfit, hat, bathing suit and water shoes in the carry-on too. Or if you have a short flight, you can wear the suits underneath. Depending on age of course! When you arrive to your resort or hotel, sometimes you don’t have access to your room or bags right away. It’s a great time to hit the pool or the beach until you can. Just be sure you have a travel size sunscreen in your carry-on so that you are all well-protected from the sun. This helps so that you have sun protection right away and don’t have to wait for your checked bag that is carrying the full-size sunscreen. TIP: Bringing a checked bag with full-size toiletries, insect repellent, sunscreen can save you $$$. Especially sunscreen and repellent, since the prices are inflated at resorts or travel destinations. 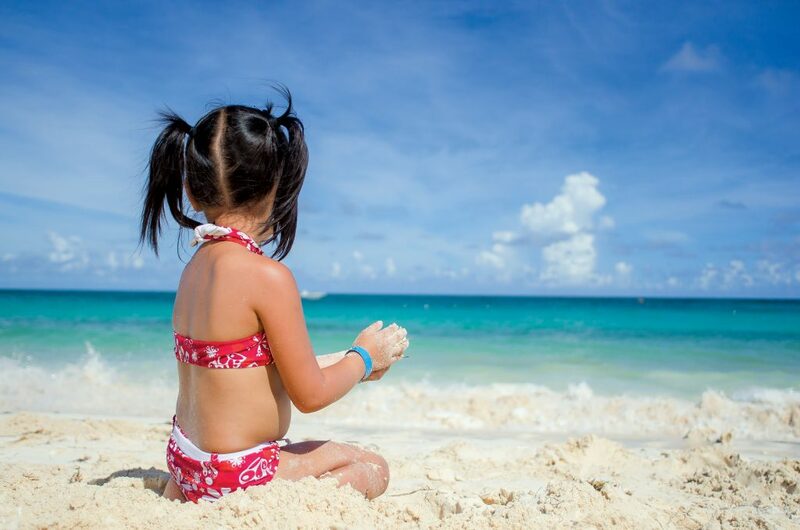 TIP: Most resorts and hotels have toiletries and if you want to save luggage real-estate and use theirs, just remember to bring along a kid-friendly shampoo and conditioner. Once you are settled in and are hitting the beach or pool, unpack those inflatable toys for some added fun! Also, giving kids their own camera or disposable helps them use their creativity and they often take some great shots! It’s a great way to see their experience through their eyes. As always, you need to be prepared for unexpected illnesses. That is why a first-aid kit armed with everything you can need when you are abroad can be very useful.. In fact, it’s the first thing I pack before I pack everything else. Since you aren’t eating at home and can be exposed to a lot of people at all times, it’s always great to wash your hands often. Especially before meals, if you are in the middle of nowhere and can’t use hand sanitizer. TIP: Bring along disinfectant wipes and wipe down surfaces, high chairs etc. I know it may seem crazy but, this has helped every time we travel. It takes seconds! Make sure your first aid kit is prepared with anti-diarrhea medication or nausea medication. These are the usual suspects when illnesses strike. But, most importantly, it’s good to have BENADRYL® for your family while traveling. Some of the more common ailments can be sneezing, runny noses, itchy, watery eyes, and hives but there are alsonew environments and situations that can cause unexpected allergic reactions. Depending on the time of the year or where you’re travelling to, having BENADRYL® Itch Spray on hand is a good idea for any kind of vacation activity whether it’s laying on the beach or taking a scenic hike. It will help with unexpected allergic reactions, poison ivy, insect bites, mild sunburn or skin irritations. Since it is sprayed on, you have a topical analgesic that will quickly and effectively provide relief. I simply cannot stress enough how much less stress you’ll have if you have a well-stocked First Aid Kit. Make sure to give your kit a check-up for expired products and replace them or add list items you may be missing. Check out my first-aid kit printable so you can check-off everything you will need. Now that you are prepared for your travels ahead, go ahead and make those memories, be speechless and then become the storyteller that you are! 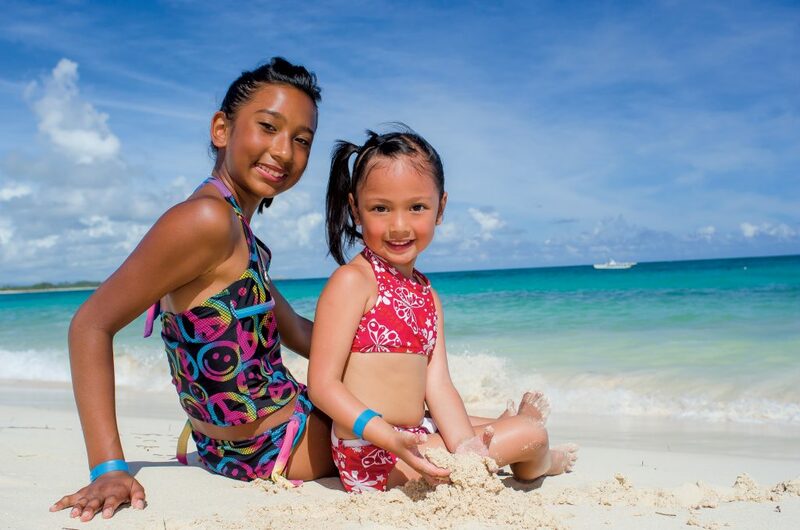 What are your family vacation must-haves to pack? Previous Post: « Put Your Child On The Path To Success with a Recognized Speech Therapist! These are great tips for packing for a family vacation! I always make sure to pack my carry-on especially well because that once our luggage was lost for most of the trip. This is such a great checklist!! This will definitely come in handy! Me too, you just never know! This is a great checklist. I always feel like I am forgetting something important when we travel. I always pack way to much when we travel as a family. I will have to try making a list next time. This is a great way to pack. I will have to save this post for my next trip. We are going on a family trip for the Holidays. I will have to make a list like this before I start to pack. There is a printable, save yourself some time! I wish I was on the beach right now. Snowflakes all week, and as much as I love them, I miss the warmth. I am with you, it is chilly here! I love the checklist! Packing for kids is so hard because they change their mind about what they like so often. My pleasure, hope you can make your trip! This checklist would be helpful! We are planning to have an vacation this coming Christmas. I hope my family and I can take a tropical vacation soon! I love this list because I was not sure how to pack if this happens. That is awesome! I am glad it helps you! This is such a complete list of packing tips! I wish I was packing for a beach vacation, right now we are getting inches of snow.